With every advance in robotics, we get closer to being able to order stuff from Amazon and have no human being participate in its delivery. Key step in this dream: warehouse robots, smart forklifts able to control and inventory and entire warehouse full of pallets, without the meat community getting involved. [Thomas Risager] designed just such a system as part of his Masters Thesis in Software Engineering. It consists of five LEGO Mindstorms robots working in concert (video embedded below), linked via WiFi to a central laptop. Mindstorms’ native OS doesn’t support WiFi (!!!) so he reflashed the EV3’s ARM9 chip with software developed using Java and running under LeJOS. On the laptop side [Thomas] wrote a C++ application that handles the coordination and routing of the forklifts. We can see a lot of weary forklift drivers ready to kick back and let a robot have the full-time job for a change. The robots use WiFi to a central laptop. Mindstorms’ native OS doesn’t support WiFi (!!!) so [Thomas] reflashed the EV3’s ARM9 chip with software developed using Java and running under LeJOS. On the laptop side he wrote a C++ application that handles the coordination and routing of the forklifts. [Thomas] is sharing his forklift design. Now to scale up — maybe with DIY forklifts like we published earlier? We can see a lot of weary forklift drivers ready to kick back and let a robot have the full-time job for a change. [Robert] does a fair bit of metal casting, and of course that means carrying around hundreds of pounds of sand, scrap, and other materials. He came up with a great solution to the inevitable back pain: a small, workshop-sized forklift able to carry around a half ton pallet. In the actual build thread for this forklift, [Robert] goes over the design. 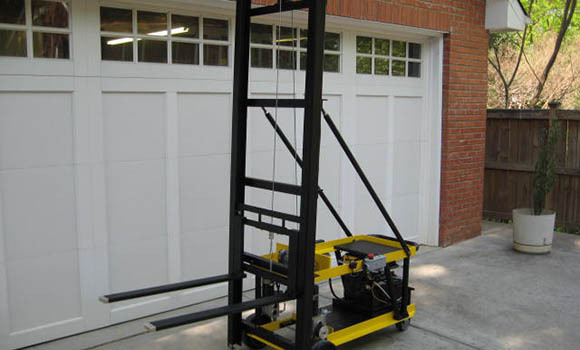 The lift is designed to fit inside a 30″ x 7′ door frame, but is more than capable of hoisting hundreds of pounds over the operator’s head. It’s driven by two electric wheelchair motors with power provided by two car batteries. There’s also a clever bit of engineering that went into tipping the forks: instead of a hinge on the mast, [Robert] used a linear actuator on the rear wheels to put the forks at an angle. It’s a great build, and since [Robert] does metal casting, there’s a whole bunch of custom metalwork that really adds to the build. After the break you can see a video of [Robert]’s forklift transferring a pallet weighed down with 5 gallon buckets from one really high shelf to another. The job doesn’t take long and doesn’t require any lifting, so we’ve got to hand it to [Robert] for this build.